View of the Strong Tower at Kenilworth Castle in Warwickshire. Dating from the 12th century, Kenilworth is one of the largest and most magnificent ruined castles in England. By the 13th century the castle was already a formidably fortified structure with a curtain wall surrounded by extensive water defences including pools, a moat, marshes, and a vast artificial lake, the Great Mere. From 1361 until 1399 it was held by John of Gaunt, the fourth son of King Edward III, who began the process of turning Kenilworth into a palatial medieval residence. The Strong Tower is part of the complex of 14th-century buildings he erected on the west side of the site. A square three-story structure, it forms the north wing of the Great Hall, a magnificent banqueting space to which it was linked. Its counterpart on the southern wing was the Saintlowe Tower and adjacent to this was another grand chamber, the White Hall. 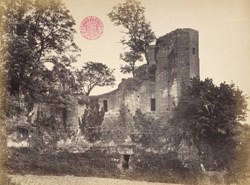 This is one of 23 photographs illustrating a guide to the history and architecture of the castle by the Reverend E. H. Knowles. In his chapter on the Kitchen, Hall, Buttery, Pantry and Cellars, he wrote: “This part is called the Strong Tower (Mervyn’s Tower, by Sir Walter Scott).” Scott’s 1821 historical novel 'Kenilworth: A Romance' is a fictional account of the alleged murder of Amy Robsart, who was secretly married to Robert Dudley, Earl of Leicester. Scott imagines her taking up quarters in the Strong Tower during the grand occasion of Queen Elizabeth I's royal visit to the castle in 1575. She died in suspicious circumstances and Leicester was implicated in her death. Knowles writes: “She died on the 8th September, 1560, by the hands (as it was believed) of Sir Richard Verney and Antony Forster, two of Dudley’s retainers.” Queen Elizabeth I gave Kenilworth to Leicester, her favourite, in 1563.